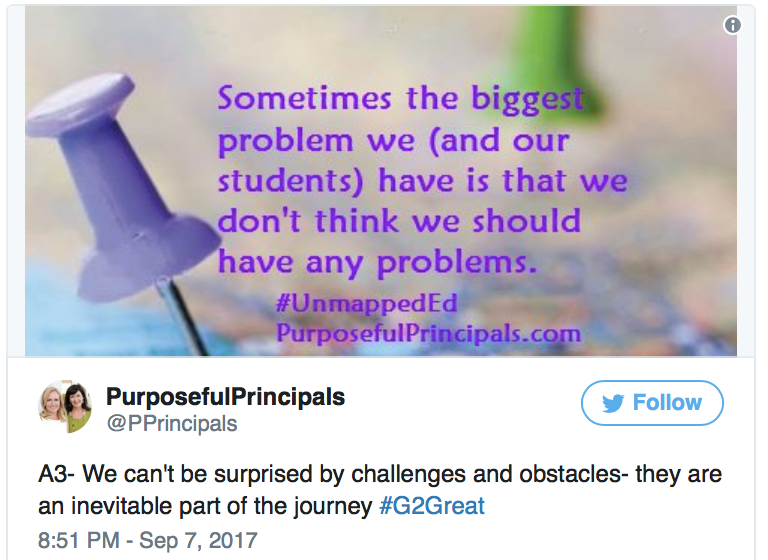 September 14, 2017, was a very special #G2Great. We celebrated our friend, Rich Czyz’s new book The Four O’Clock Faculty A Rouge Guide to Revolutionizing Professional Development. Rich wrote this book to help us to expand our thinking about what professional learning might be. 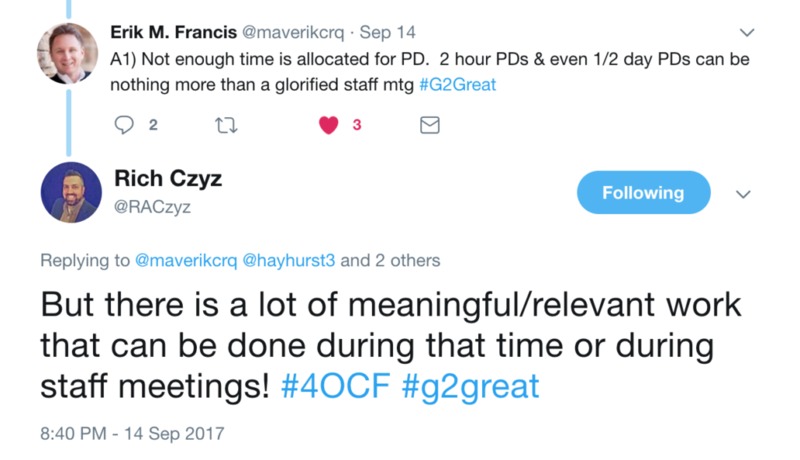 The #G2Great PLN understands that professional learning has been forever changed. They embrace and look for new opportunities to learn. 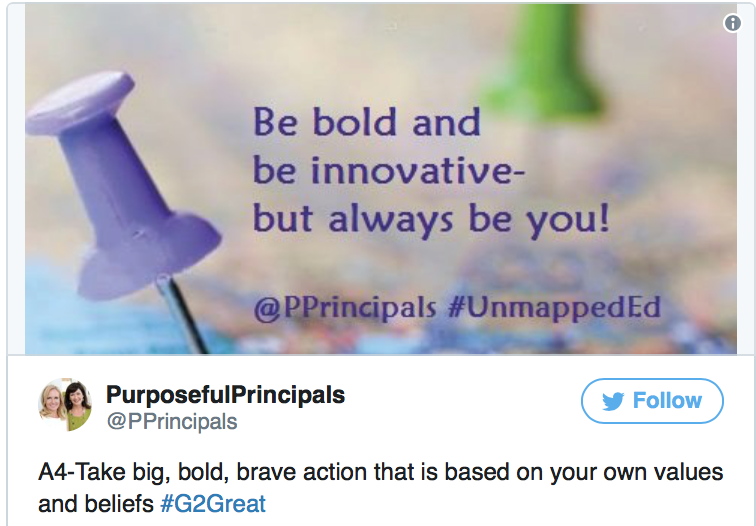 We are so honored that guest blogger Val wrote our #G2Great post this week. Val is an instructional coach and blogger. The idea of differentiating instruction to accommodate the different ways that students learn involves a hefty dose of common sense, as well as sturdy support in the theory and research of education (Tomlinson & Allan, 2000). 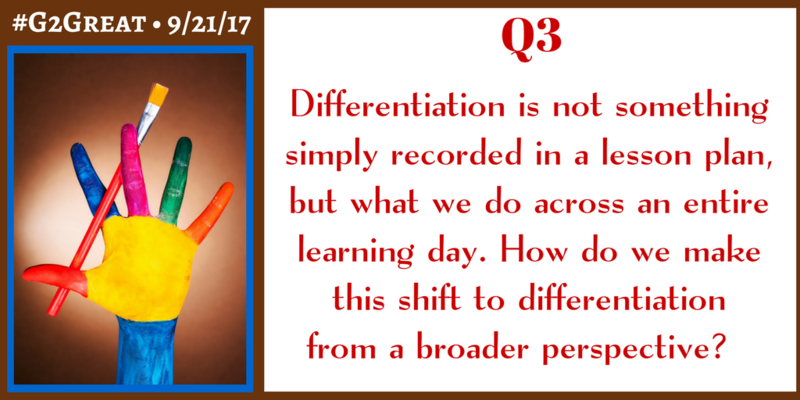 It is an approach to teaching that advocates active planning for student differences in classrooms. 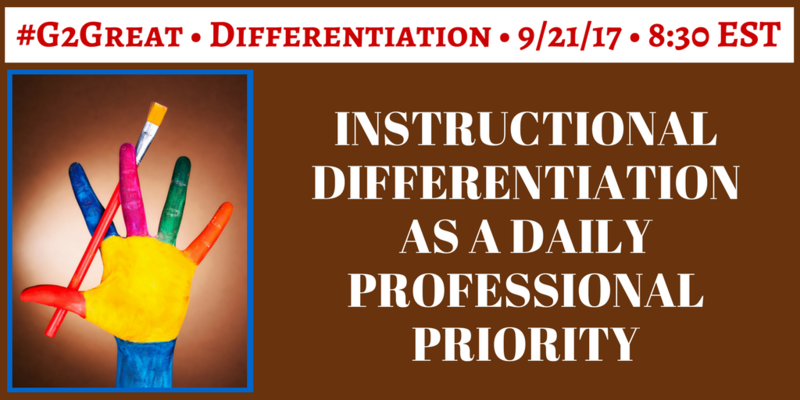 Differentiated instruction can, for many educators, be a Pandora’s Box of sorts. We know there are powerful outcomes when we commit to research-based instructional moves that enrich learning for all kids, but if we’re honest, we also worry about the burden and hardship. Every educator understands the cost of thoughtful, careful instructional planning based on close observation of the kids in their care. We know it, and at the same time we must admit that for many of us, we dread it. 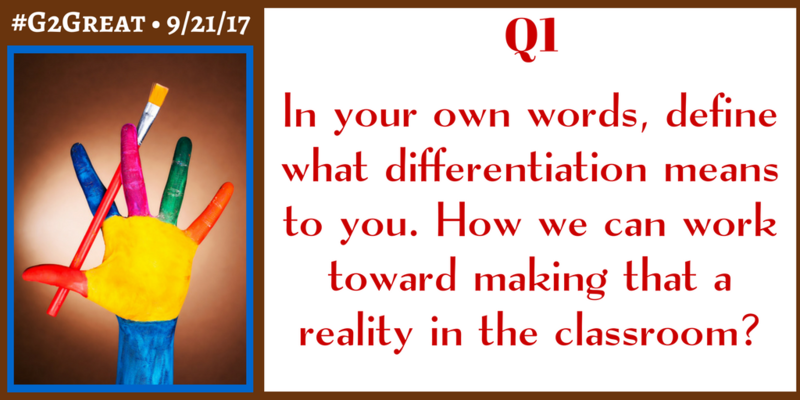 This week’s #G2Great chat was the perfect antidote for our teacher fear of all that differentiation entails. 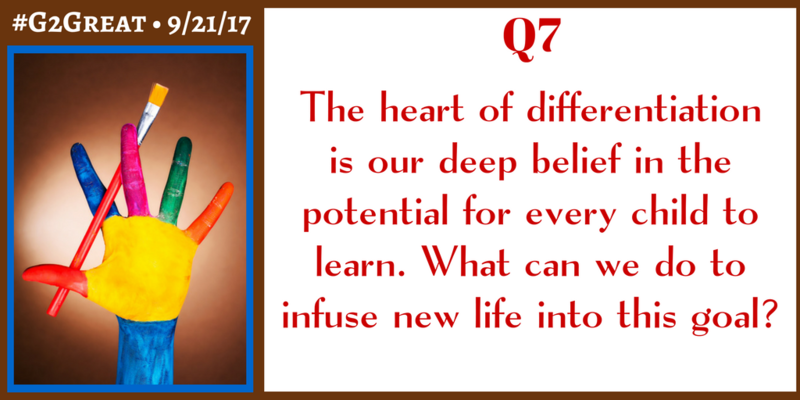 We begin, I believe, by reflecting on the very questions guiding the chat tonight; the profound, rudimentary bits of an indomitable approach to teaching that’s committed to personalized instruction for all our kids. 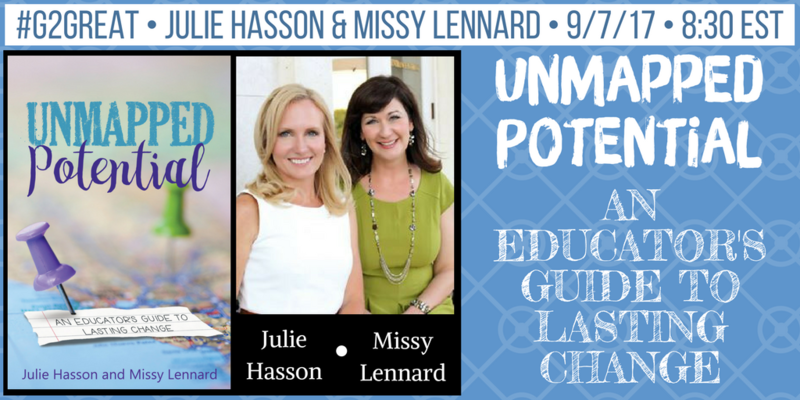 When we’re able to start from that understanding, that teaching kids is as simple as celebrating their uniqueness, we allow ourselves and our beloved students room for genuine growth. When we’re able to begin with an inclination to see and celebrate all our students’ endowments, we start with promise and not privation. 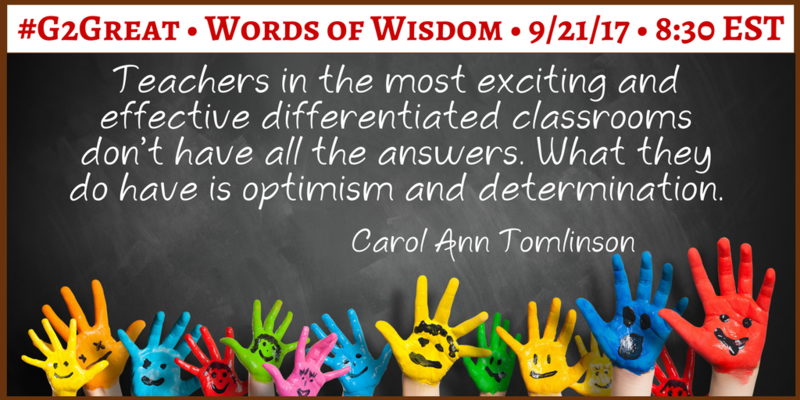 When we choose to think of differentiation as a “student-centered” mindset then we open up the possibility that every day holds tremendous possibility and opportunity for joy. Joy in discovering the unique assets (and needs) of each child in our care. 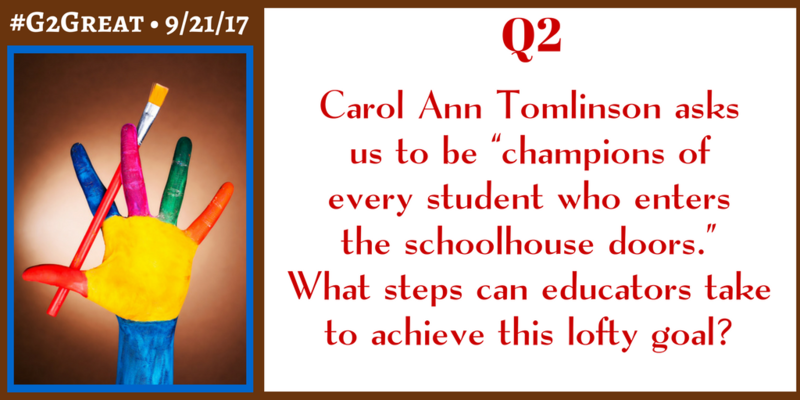 I was personally elated on August 31, 2017 when we opened our #G2Great doors to welcome guest host Laura Robb. Laura has long been a professional inspiration to many educators, but her presence was an added blessing for me since she is also a treasured friend. 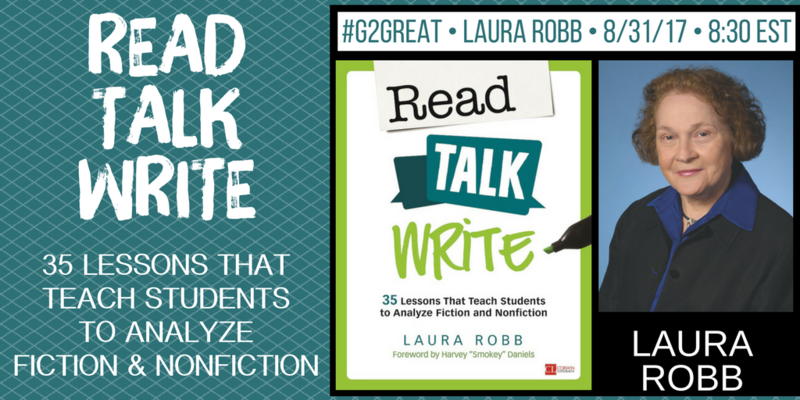 On this night, we gathered enthusiastically around the Twitter screen to soak in Laura’s immense wisdom and celebrate her newest book, Read Talk Write: 35 Lessons That Teach Students to Analyze Fiction and Nonfiction (Corwin, 2017). My reflection: Our first step is to take professional responsibility for this process. We cannot create an instructional setting where student-centered talk is valued by students until we are willing to hold this process in the highest esteem. Before we can create an environment where the high quality talk we desire for students becomes a habit of mind, we must acknowledge our role in this process. When talk is viewed as a professional must then it will become the WHY that drives us each step along the way to this rich collaborative dialogue. Laura reminds us that this is not an occasional event to be scheduled at key intervals in the day, but a non-negotiable daily priority that permeates the very air that we breathe across every learning day. My reflection: In order to create the powerful discourse we deem worthy of our students, we must first build a strong bridge between teacher supported and student engaged talk. We begin by creating a safe and supportive environment that will nurture the kind of engaging talk we want for students. Within this safe environment we can then offer the instructional models to demonstrate each step of the talk process. These scaffolded supports allow us to show our students what rich dialogue looks like, sounds like and feels like so that we can begin to relinquish responsibility to them for accountable talk. With productive and meaningful talk always in our sights, we heed Laura’s wise reminder that we cannot rush this supportive phase. My reflection: This release of responsibility allows us to create a forum that will support the kind of real life conversations we want students to have with their peers. These authentic conversations are grounded in ‘passionate and intense’ talk that we want students to continue to have with others long after they leave our classrooms – the very kind of conversations we have in our own lives. 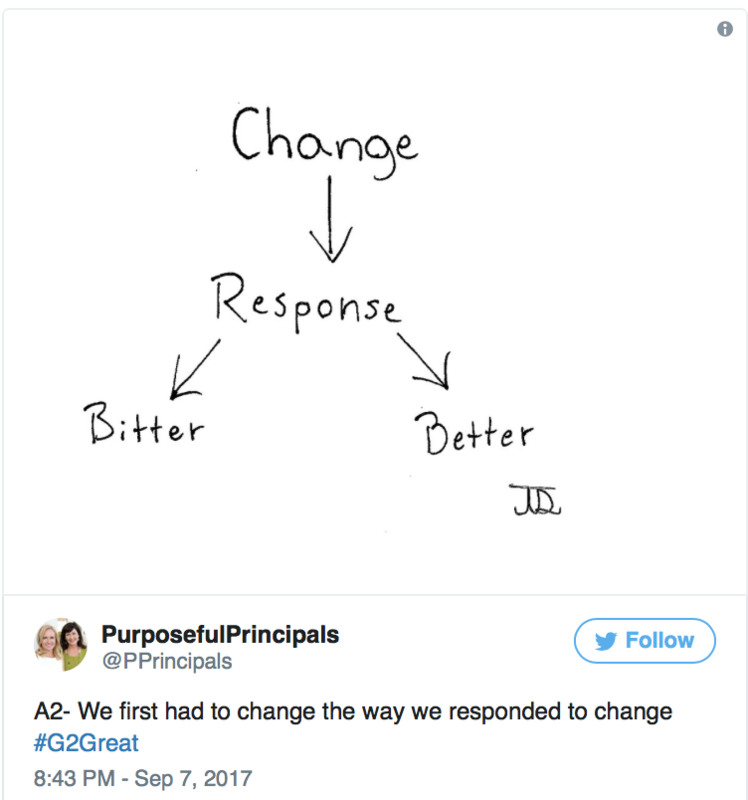 Once we have set the talk stage with support, we then begin to step back and allow students to craft the structure of these conversations so that they can assume control of the decision-making process. We trust our students to make these important decisions based on the foundation we have put into place as our role shifts from a supportive one to that of facilitator as we use these experiences to fine-tune and extend learning. My reflection: I opened this overview by emphasizing that we must begin by valuing the talk process as we make it integral to every instructional day. We maximize our framework by stretching talk across all content areas but this is only the beginning. 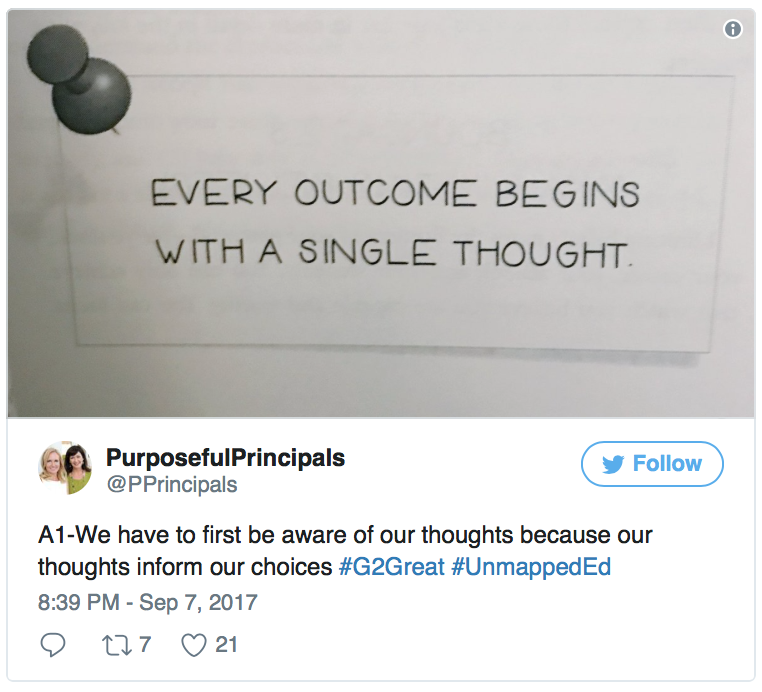 We are cognizant that all we choose to say and do will send a message to students about how we view these experiences as we allow these conversations to grow with students. In other words, our day-to-day actions and how we treat the talk experience with the respect it deserves will impact students most. Making time and space for student-centered talk is important but we must also show in every aspect of our practices that we value an organic process for meaningful dialogue. We do this by choosing not to apply a grade to this process-based practice, by creating experiences worth talking about and by celebrating that students assume increasing control. We acknowledge that student-centered talk cannot be relegated to a list of narrow questions that revolve around trivial conversations. Above all we trust students to reach ever higher as their conversations begin to take on a life of their own and we honor this transformational student-driven process each step of the way. 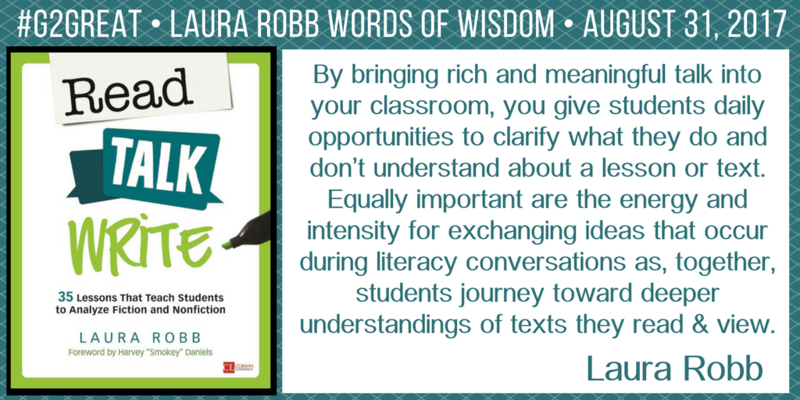 We accept your invitation Laura and we will carry each of your conversation inspirations in our back pockets as we put your words into action where it matters most – in high impact talk infused classrooms across the country!